One of our surveyors made a worrying discovery in a property in Leicester recently that shows the possible dangers of hidden defects that are left to deteriorate. The chimney breast had been removed in the kitchen, but had been left in the loft above it – where it was supported only by a piece of timber and the ceiling rafters! 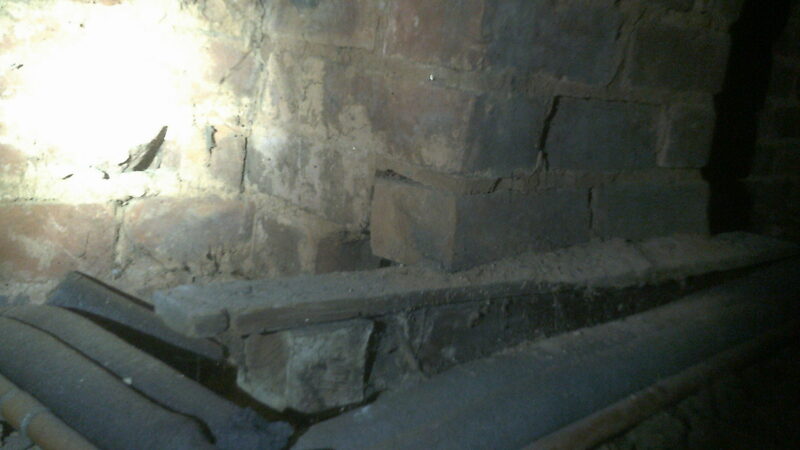 The chimney had clearly cracked due to poor support and could eventually have fallen through the roof into the kitchen if it had remained hidden. Needless to say, the potential buyers were relieved that they had commissioned a survey. If they hadn’t, not only would they have had to spend an extortionate amount of money when the chimney breast fell through the roof, but it could have seriously injured someone in the process. The money spent on the survey was certainly worth it! Surveys can not only save you money, but keep you safe as well. If you are thinking of buying a house, then please, for your peace of mind, let us check it for you first.